Photograph of the first conference in 1911 at the Hotel Metropole. 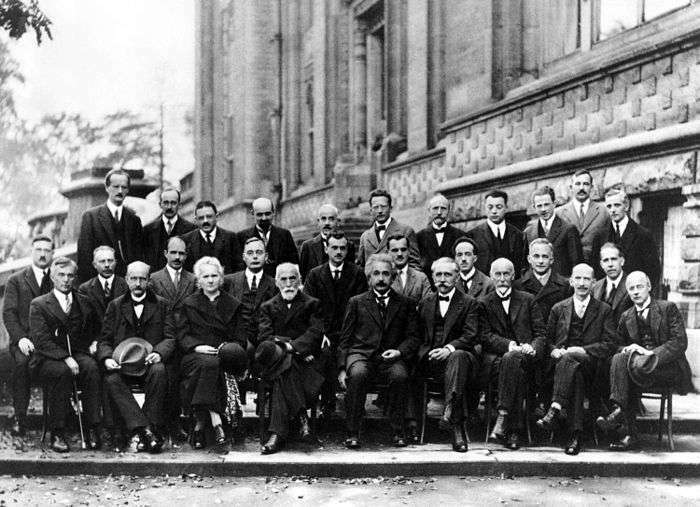 Seated (L-R): W. Nernst, M. Brillouin, E. Solvay, H. Lorentz, E. Warburg, J. Perrin, W. Wien, M. Skłodowska-Curie, and H. Poincaré. Standing (L-R): R. Goldschmidt, M. Planck, H. Rubens, A. Sommerfeld, F. Lindemann, M. de Broglie, M. Knudsen, F. Hasenöhrl, G. Hostelet, E. Herzen, J.H. Jeans, E. Rutherford, H. Kamerlingh Onnes, A. Einstein and P. Langevin. 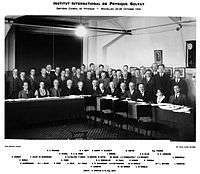 The first Solvay Conference following World War I was held in April 1921. Most German scientists were barred from attending. In protest at this action, Albert Einstein, himself a citizen and a vocal supporter of the infant Weimar Republic, declined his invitation to attend the conference where most of his countrymen were barred. ↑ Leplin, J. (1984). Scientific Realism. University of California Press. ISBN 978-0-520-05155-3. Straumann, N. (2011). 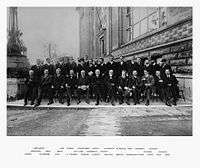 "On the first Solvay Congress in 1911". European Physical Journal H. arXiv:1109.3785 . Bibcode:2011EPJH...36..379S. doi:10.1140/epjh/e2011-20043-9.